Sometimes when we cook nilagang bulalo or beef shank soup there are left overs. There are other dishes that you can make if there are many left overs specially the meaty parts. You can make adobong bulalo or asadong bulalo. 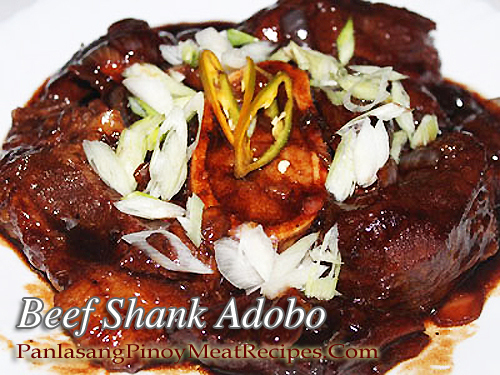 To cook beef shank adobo or adobong bulalo; You can get the beef shank from a nilagang bulalo dish but if you don’t have any you can boil the beef shank until the meat is tender. You can use a pressure cooker to speed up the cooking. (Before boiling the beef shank, put 1 pc peeled onion, sliced in half.) Remove the cooked bulalo from the soup stock and get the meat with the bone shank. In a deep pan or wok, heat the cooking oil and saute garlic and onion. Then follow the beef shank or bulalo and stir fry with the sauteed garlic and onion. Allow the beef to fry a little bit for 3 minutes. Then pour the soup stock and pepper. Simmer for 5 minutes then add the oyster sauce, vinegar and sugar. When the sauce becomes thick, remove from fire and serve hot. Remove the cooked bulalo from the soup stock and get the meat with the bone shank. In a deep pan or wok, heat the cooking oil and saute garlic and onion. Then follow the beef shank or bulalo and stir fry with the sauteed garlic and onion. Allow the beef to fry a little bit for 3 minutes. Then pour the soup stock and pepper. Simmer for 5 minutes then add the oyster sauce, vinegar and sugar. When the sauce becomes thick, remove from fire and serve hot. Bakit wala pong video. Mas makakatulong po yun 🙁 pro thanks anyway. Try ko nlg kung kaya ko. Hindi po talaga ako marunong mg luto po eh. @Rachelle Hindi naman po mahirap magluto kayang kaya nyo po yun.